As you know, Fine Art Shippers specializes in moving fine art of any type, from paintings and drawings to stone statues and modern installations. However, we are also experienced antique movers working with many reputable dealers and auction houses from around the world. For example, we frequently move antique pieces for iGavel Auctions, pick up real treasures from Sotheby’s, and ship antique furniture for various galleries and stores. Our team of antique movers has enough expertise to handle even unique museum-quality artifacts and multi-million-dollar pieces of exceptional value. Besides, we are collectors ourselves and do enjoy visiting different antique shops in NYC, including the famous Bardith Antiques located on the Upper East Side, at 135 1/2 East 79th Street. Founded by Edith Wolf in 1964, Bardith has long been a go-to place for fine and rare English porcelain and pottery from the 18th and early 19th centuries. 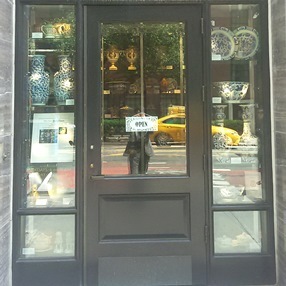 Besides, this amazing shop also offers an impressive selection of antique Dutch Delft, French pottery, and Chinese porcelain. You can find here literally everything, from individual items and plates to vases and full dinner services. Besides, Bardith Antiques also has an outstanding collection of 19th-century silhouettes and needlework. What is no less important, its inventory is always changing so that you are sure to find something new each time you visit this fantastic shop. Our team of antique movers loves Bardith Antiques, and it is definitely worthy of your attention if you are looking for fine porcelain and pottery in NYC. Superb place with great service!